Log loader with crew. 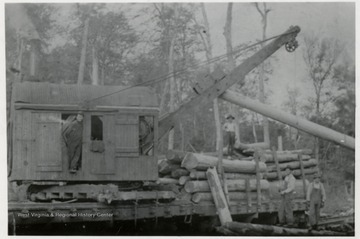 "This is the way they load logs on the Elk River. S.G."
2. Elk River Bridge Disaster, Charleston, W. Va.
Elk River Bridge Disaster, Charleston, W. Va.
Cables and wooden bridge has fallen into the Elk River. 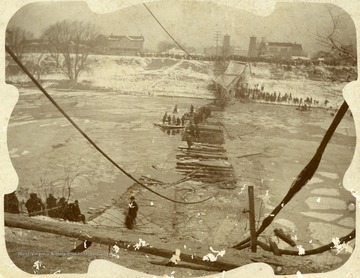 People line the shore and bank of river to watch the rescuing of people from the bridge. 3. 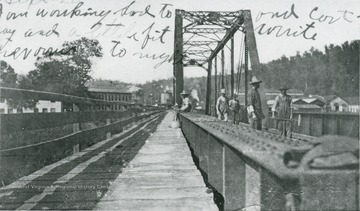 Elk River Bridge Disaster, Charleston, W. Va. 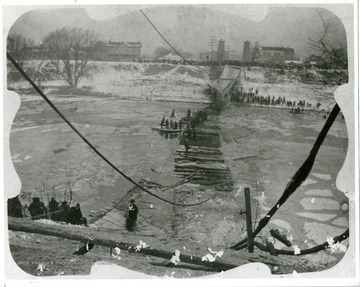 Crowds gather along the banks of the Elk River while people walk out on the fallen bridge to rescue people in the water. 4. Town of Gassaway on Elk River Looking Southeast, Braxton Co., W. Va.
Town of Gassaway on Elk River Looking Southeast, Braxton Co., W. Va. 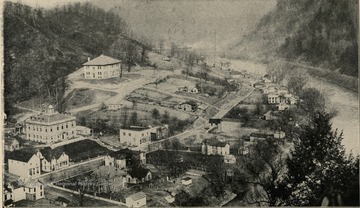 Showing the Town of Gassaway of Elk River looking southeast, and topography of Monongahela and Conemaugh series. 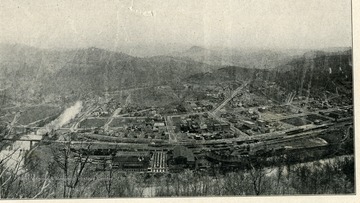 Coal and coke Railroad shops in the foreground in Braxton County, W. Va.
5. Number 4 Railroad and Foot Bridge across the Elk River, Gassaway, W. Va. Number 4 Railroad and Foot Bridge across the Elk River, Gassaway, W. Va.
6. Number 2 Bridge Over Elk River, Sutton, W. Va. 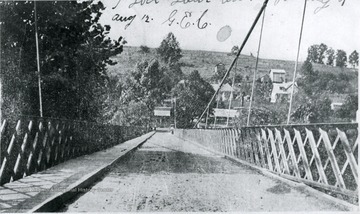 Number 2 Bridge Over Elk River, Sutton, W. Va.
Print copy of a photograph postcard with correspondence on the image. " Juergens and Walker" are possibly the publishers. 7. 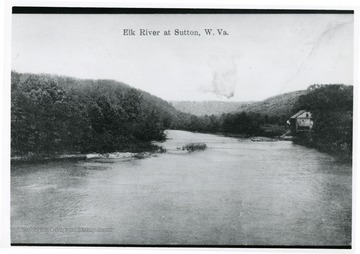 Elk River at Sutton, W. Va.
Elk River at Sutton, W. Va.
8. Town of Sutton, County-Seat of Braxton, W. Va.
Town of Sutton, County-Seat of Braxton, W. Va.
9. 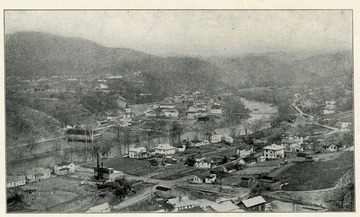 Aerial View of Clay County Looking Eastward Up Elk River, W. Va.
Aerial View of Clay County Looking Eastward Up Elk River, W. Va. 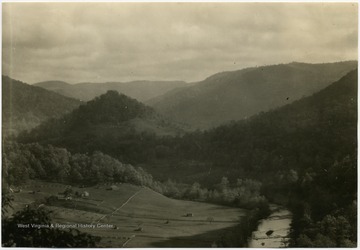 Plate IV- Showing Clay County-seat of Clay County, looking eastward up Elk River, and topography of Kanawha group, Pottsville series. 10. 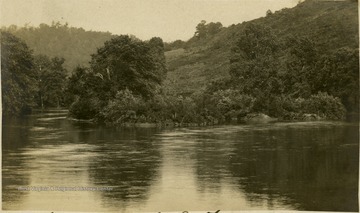 Scenic View on the Elk River at Sulton, Mercer County, W. Va.
Scenic View on the Elk River at Sulton, Mercer County, W. Va.
11. 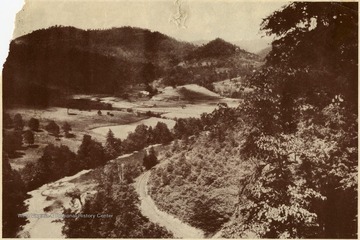 Aerial View of Elk River from West Virginia Route Number 15, Nicholas County, W. Va.
Aerial View of Elk River from West Virginia Route Number 15, Nicholas County, W. Va.
12. Elk River Valley, Webster Springs, W. Va.
Elk River Valley, Webster Springs, W. Va.